Who dares thwart the power of Zeus? Surge protectors and lightning arrestors are devices that protect electrical components from a temporary rise in voltage and current on an electrical circuit. Surge protectors are designed to protect electronic equipment from power surges and voltage spikes by diverting the excess current from the transient event or surge into a grounding wire. Surge protectors are also referred to as Transient Voltage Surge Suppressors (TVSS), Surge Protection Devices (SPD), or Surge Suppression Equipment (SSE). Lightning arresters, aka lightning diverter or surge arrestors, are protective devices for limiting surge voltages caused by lightning strikes to prevent damage to equipment and disruption of service. The obvious answer is an angry Hellenic deity and, in truth, much of the damage to electronic systems equipment from a random power surge is due to lightning strikes. However, the most damaging aspect about lightning to a telecommunication system or transmission line is not the power wielded in a spear of lightning, or a direct lightning strike, but is instead caused by power surges via the strong electromagnetic fields created during a lightning strike. Lightning bolts carry from 5 kA to 200 kA and voltages vary from 40 kV to 120 kV. A typical cloud-to-ground lightning bolt moves downward from the bottom of a storm cloud toward the ground at about 200k mph and just as it nears ground, a surge of positively charged electricity moves up to meet the negatively charged bolt and a visible flash of lightning streaks upward conducting electricity as lightning. Lightning strikes, even several miles from a structure, can generate a power surge that travels through aerial or buried cable lines to sensitive electronic equipment. Direct lightning strikes to equipment and cables are too powerful to protect against, however, protection against transient surges can be accommodated by equipment and system design. Other causes of power surges can be attributed to equipment fluctuations or failures, faulty wiring or system design, or environmental hazards. Diverts energy with a current waveform of 10/350ms with a current ratings from 10Ka to 35Ka. 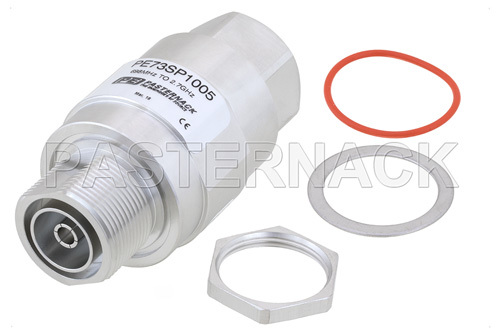 Includes high energy metal oxide varistor (MOV) and gas discharge tube/air gap components. Diverts energy with a waveform of 8/20ms with a current ratings from 5Ka to 200 Ka. Includes silicon avalanche diode (SAD) and metal oxide varistor (MOV). Underwriters Limited issued UL 1449 4th Edition as the safety standard for all AC surge protection devices (SPDs) which covers SPDs designed for repeated limiting of transient voltage surges on 50 or 60 Hz power circuits not in excess of 1000 V. There are several kinds of surge protective devices (SPDs) and the following performance characteristics are the most important to consider in system design. MCOV is the maximum steady state voltage the SPD can tolerate before becoming a safety hazard. Current safety requirement specify that, in the case of an overvoltage of 110% of nominal voltage, the device must remain functional and safe and should an abnormal overvoltage of 125% occur, the device is will safely but permanently cease to function. VPL is the residual voltage or clamping level of the arrester which is indicative of the reaction time of the arrester such that the faster the reaction time, the lower the VPL. The arrester does not detect the transient surge or the transient damages the equipment commonly generated by inductive loads switches on air conditioners, lift motors, or standby generators. > Clamping voltage – indicates at what voltage the MOVs will conduct electricity to the ground line. A lower clamping voltage usually indicates better protection. > Energy absorption/dissipation – given in joules, this indicator measures how much energy the SPD can absorb before it fails. A higher number indicates greater protection. > Response time – SPDs have a slight delay when triggered by a power surge. A longer response time indicates equipment will be exposed to a surge for a longer time, and where high voltage is concerned, every nanosecond matters. SCCR indicates the suitability of an SPD for use on an AC power circuit capable of delivering not more than a declared rms symmetrical current at a specified voltage during a short circuit condition. It is the amount of current that the SPD can tolerate safely and safely disconnect from the power source under short circuit conditions. For RF and Microwave applications, RF surge protectors must also be made to limit degradation of wanted signals, while still preventing surges. This means that a low inline attenuation to signals above surge frequencies is desired.